February is the best time for grapes. On the farm, we are harvesting wine grapes, and in the garden, a favourite summer stop is in the shade of the pergola, which is covered in table grape varietals. From one end of the pergola to the other, we have 19 varieties growing, carefully selected so that they ripen one after the other, thus keeping us well stocked with grapes. 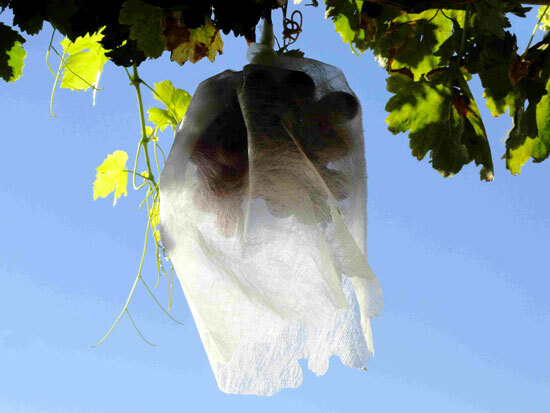 Birds and squirrels love to nibble on the sweetening grape korrels, and whilst we’ve nothing against our furry and feathered friends, our guests are our priority, which is why we’ve covered the bunches in white protective open-ended bags. Picking for breakfast at Babel this week, we will be adding (from L-R) “Alphonse”, “Red Globe” and “Victoria” to our early morning harvest. Hi Beatrice. We got them at the Agrimark in Paarl. It comes in rolls, and then we cut them the size we want.